AirZone trampoline is the name of a big firm producing trampolines for children. Their products are certified by an independent laboratory to pass all ASTM safety requirements. You can find the best trampoline for your kids from their supplies of numerous styles, sizes and materials. However, the first mission of AirZone with regard to this kind of product is SAFETY. Therefore, this is the great idea when you want to have a perfect playing-ground for your children. There are five selections of size in case of the trampoline. This is an ideal way for your children enjoy fun with their friends and families as well. It has a sturdy frame that is made from a rust-resistant steel, W-shaped legs for stability, high-quality steel springs, a cover that prevent kids from negative impact of weather and a thick rail padding for additional protection. This is a kind of traditional style – round trampoline, saving the safety in effective way. By this type, kids have more freedom air when making bouncing on the trampoline. With the high-performance steel frame and cover, W-shaped legs ensure its safety for kids. It can help them prevent from unwanted injury when jumping higher in the air and gradually down. Spring trampoline is not covered by any net so gives children liberty feelings. However, it requires them to keep good balance when using it. It has the same performance of the first type. However, about the construction, there remain some remarkable points. The Trampoline Enclosure has durable, 360 degree, non-abrasive polyethylene mesh netting that is tightly connected to the poles. It has 5 padded steel masts, proving safety and long lasting use. The closure arch allows children conveniently to be in or out because of quick and easy door opening. Safety: The first mission of Airzone trampoline is Safety. Their products are certificated by ASTM – an independent laboratory. According to them, trampolines are used to create a play-ground for kids to enjoy. Along with fun of bouncing, the safety during playing is very important. Therefore, they always find the best materials to make different parts of a trampoline. The galvanized steel frame is covered by resistant PVC, adding protective padding over the frame and outer landing area. Moreover, the enclosure is UV-protected landing mat provides safety and longevity for your kids to use. Easy assembly: After purchasing the product, you do not worry about how to set up the trampoline. The instruction is supplied in details and very simple to understand. Plus, you are more comfortable when carrying it anywhere you want. The AirZone is very easy to assembly. It is very suitable for you and your kids in outside picnic or trips. Durability and Long time to use: The durability of the trampoline is performed through the W shaped legs. This makes the trampoline be sturdy and there is no tipping or wobbling when kids higher jump on it, as a result. Beside, the longevity is one of outstanding features of Airzone trampolines. It is designed to deal with weather resistant, UV prevent and the use time. The moderate price but gives you a valuable product. Friendly and high–quality interface: The bouncing interface of AirZone trampoline is made from elastic materials, allowing children to make higher jump as their ability. Also, the design is created to improve skill of keeping balance for kids when they playing. This could be very useful for you in the future when learning how to ride motor, probably. The flexible sizes of this product give children more choices to pick up. The age of children varies within a large scale thus; this positive point is more preferred when parents have any suggestion to buy it. Perfect for children: The different sizes and safety ensured make Airzone trampoline ideal for youngsters. They are designed specifically for kids. Also, there are used more different materials that make your trampoline sturdy and serious for children to play. The elastic bands are used to replace the spring, or nets and enclosures are made from good materials for a sense of security. Thus, sometimes, you can let your children freely play on the surface without your supervision. Safe jumping: The trampolines are created for children to train them on how they can use the apparatus. This idea is very correct and obligatory. More importantly, you are able to have a play-yard for youngsters wherever you want because it is very easy to carry on and set up. The instruction of assembly sounds not difficult and very clear for anyone to follow. You also teach your kids how to set up and get it as the first after jumping on it. Besides, you may supervise and watch the children whereas they are enjoying on the trampoline. It could be used indoor or outdoor with different sizes. Enjoy fun and Do fitness: The safety ensures to bring enjoyable moments to your kids when they playing on the trampoline. It takes in advance of giving chance for children to do fitness. The reason is the establishment of trampolines focuses on bodily training and exercise for youngsters while the overweight among children is becoming an alarming issue. Trampolines make a superb source of training for kids, but not mandatory activity. Thus, trampolines are beneficial for kids, being with coordination growth, steadiness and rhythm as well. Every kid when enjoying Airzone inch trampoline & closure has effectively witnessed a specific experience. It is because it ensures that every product is the best quality and be manufactured to make the AirZone proud. It has a positive point when keeping parents as well as children in mind of safety although they are not under adults’ supervision for a short time. The materials and sturdy constructions ensure the safety while they are jumping in and out. Besides, the extra padding on the mesh fabric increases more the safety for their children. The safety of the product must be shown through the stability. Also, the different sizes are always available for kids to enjoy at various ages, weights and more. The padded cover of the trampoline is designed to give children soft landing. One more important thing is this kind of AirZone trampoline can be easily assembled. It has no difficulty when you get a user manual with the product. To attract your children, you can select cute and exciting colors to encourage them. And the last, it has been surpassed the set safety standards, certainly. The second favorite product of the brand is named AirZone Outdoor Spring Trampoline with Mesh Padded Perimeter Safety Enclosure. It has galvanized steel frame, ensuring the safety for kids when playing. The patent pending security enclosure greatly ties to the perimeter and the jump mat. Therefore, it will keep jumpers safely away from the edge of the mat. Also, the 4 W-shaped legs with 8 balanced points of contact with the ground and spring rail is added. This item might give you maximum stability, increasing the safety for players. One of common features of AirZone products is Easy to assemble with no extra tool or drilling and the construction is in very detailed. They have long guarantee and make sure of supporting customers in case they are not able to make it. The safety of product is tested to meet the most recent ASTM standard protocols. 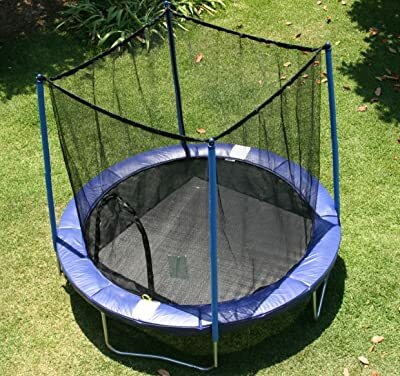 One of the most typical trampolines with Enclosure that get more favorite of kids currently. 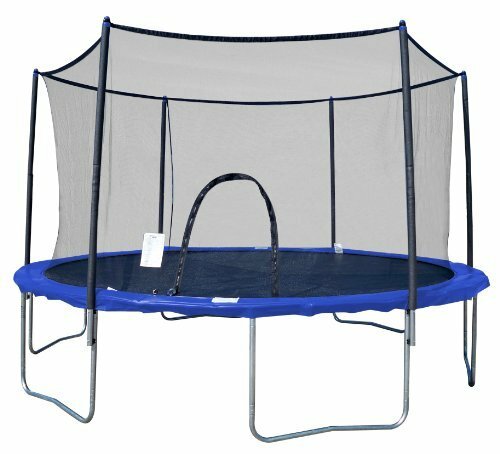 This must be AirZone 10–Feet Spring Trampoline with Enclosure. It is undeniable that, AirZone with their products always ensures the safety for players. In this product, you can see its frame that is manufactured using durable, rust-resistant steel. Moreover, legs are in W-shape with points in contact with the ground. At the same time, they create points for each leg for an extra stability. The longevity and durability are still ensured when it comes this trampoline. It has high-performance, stainless steel springs that are protected by a weather-resistant PVC frame cover and padding with thick sewn-in. The enclosure set-up eliminates more drawstrings and make sure of it is always suitable with the frame. Added bungee cord around the cover helps netting taut and keeps the safety of the enclosure masts. 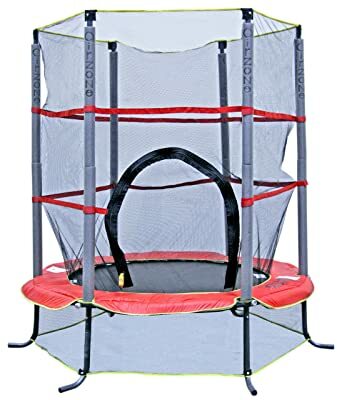 The size of trampoline is fixed at the first time when you need to define your kids’ ages or weights before making purchase of the product. AirZone trampoline – as one of the best trampoline brand – gives parents more and more chance to make your kids enjoy funny jumping in safety. The frame, padding, legs and enclosure are made from very valuable materials, keeping youngsters in safe environment when they jump on the trampoline. They keep kids not be throw out the trampolines suddenly thus there is no unwanted injure. They make guarantee of the safety standards that are set by a famous organization ASTM. This must be your right selection, right!